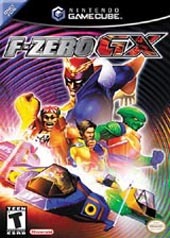 F-Zero GX is quite possible one of the hardest racing games to be released. But that doesn't mean you should avoid it. It's one of those games where you master the game play down with each try. It's kind of expected for this game to be difficult, since it was developed by Amusement Vision, who did the Super Monkey Ball series, as well as Daytona USA (another racer with a high learning curve and high speed). Wait, what did I just say? F-Zero GX was developed by Amusement Vision, who is owned by Sega? Is this Bizarro world? Nintendo's old competitor is now helping out with their projects? Well, it's not so shocking in today's world, and something like this was long overdue. I think many have waited to see Nintendo and Sega do something together, and now it's finally happened, with pretty damn good results. F-Zero GX may very well be the fastest game ever created. It blasts past futuristic racers such as Extreme G3 and the WipeOut series out of the water, and now has overtaken Burnout 2 as the Gamecube's speed king. The only thing to beat F-Zero X's sense of speed is a sequel, and now we have F-Zero GX. F-Zero GX is a pretty simple game to grasp in terms of your goal: drive fast, rank high and win at all costs. But putting that into practice takes some mastering. Those who played the hell out of every F-Zero game up to this one, especially F-Zero X, may fall right into this installment without as much trouble as a person new to the series. There are three things you need to master in this game: the course layout, dealing with the AI, and handling the sense of speed. As a matter of fact, if you master the speed, you'll have an easier time dealing with the other items. Technique is more or less the key here. You have to decide if you want to take out your opponent or risk losing speed. You'll need to decide if it's more important getting one last boost out of your energy supply for that slight edge or risk retiring the race from destroying your machine. You need to be on your toes on each course, and remember where every boost and turn lie. F-Zero GX may seem like a simple game, but there's a lot of technique involved, and that difference can mean placing 1st or placing 27th. The game play modes offered in F-Zero GX include the Gran Prix, a Story Mode, a VS. mode, a Time Trial mode and a Practice mode. Let's get into the story mode, which a pretty surprising element to the game. Here, you assume each mission/chapter as Captain Falcon. Each mission/chapter has a unique task that is intertwined within the story's FMV. You may do such things as race against Samurai Goroh or help save Jody from an exploding track. Hell, there's even one mission that pretty much rips off Speed, where if you drop under a given speed, you blow up. Of course, rather than becoming Sandra Bullock driving a bus, your Falcon driving your, well, Blue Falcon. What's even more surprising about the story mode is the FMV sequences in between. They're done quite well, and does not look like a cheesy half-assed job. Sure, there's some lame plot elements, but this kind of quality is quite unexpected in this kind of game. I hope Namco sees this model, and hopefully somehow adapts it into the upcoming R: Racing Evolution. It adds a whole level of depth to the game. Another layer of depth F-Zero GX has is the Garage mode, which can be found in the Customize option. Here, you can take set pieces you've bought with your tickets and create your own F-Zero racer. In a way, it's similar to the Carrozerria mode offered in Sega GT, but you're limited to the booster, cockpit and hull. Still, you can make quite a bit of combinations with the pieces you earn and buy. I've been able to make a couple of racers that have outperformed the preset ones by a couple of seconds (in terms of Time Trial). And, you can make up to four of them, so you can experiment with what works and what doesn't. You can also access your racers in F-Zero AX, by sticking your memory card into a slot in the arcade cabinet. I'm not sure how widespread AX will be in the U.S., so you may have to search around for an arcade that has the machine. My best bet is that it may show up in the Gameworks arcades, if they still exist. Ok, we've talked about how it plays, but how does it look? For those who remember or still own F-Zero X for the N64, the game ran at 60 FPS (constant), but sacrificed a lot of detail. Pretty much, it was the track, racers, and maybe an occasional blocky thingamajig. It was also pretty low-res, and dithered as hell. Not any more. F-Zero GX is pretty much F-Zero X as it was meant to be. It still runs at 60 FPS (constant), is hella fast, and features more things in the environment. There's buildings and trees, and it isn't so plain anymore. Even better, the textures are pretty damn good. I could swear that a lot of these textures are bump mapped, but Amusment Vision claims they did not use bump mapping. That's a pretty good illusion they pulled off, and I'm surprised that other games do not have textures as good as this (well, Factor 5's games are an exception). The only things I can complain about in the graphics department is that some of the objects do tend to "fade in" upon approach. You don't really notice it that often, but it's there. Not as bad as Cruisn USA's fade-in, but I did see it. Not a major thing. You have to sacrifice a little for the speed. Oh, did I mention the game is fast? Really fast? You really have to play the game to get the sense of speed given here. It's like nothing you've ever experienced in a racing game. The sound, while not overwhelming, is actually not that bad, save for some oddly forced dialouge here and there. The music is pretty good, considering that the game was developed by Sega, which is notorious for some pretty nasty music. While I miss some of the classic tracks of the previous F-Zero games, two do make a bit of a return, but in a remixed state. The sound effects seem to almost be absent in a way, since your engine is pretty quiet. There are the crashing sounds, as well as the sound opponents make as they rush past you, but that's about it. The voices in the game are pretty comical, and some are a bit ostentatious. Roger Buster sounds like Randy Savage for some reason, and I don't know about you, but Captain Falcon sounds a little gay. Not that there's anything wrong with that! All characters seem to have personality except for Mr. F-Zero. This guy has the most forced dialouge I have ever heard in a game. It could have been worse. We could have had the voice actors from the Resident Evil series. In closing, I think you can pretty much gather what I think about this game. It's very good, very challenging, very fast and very addictive. The last time I played a game this much was Burnout 2: Point Of Impact. Perhaps it's no surprise that it scored the same. Of course, they're completely different racing games, and it's not that fair to compare the two. But in terms of futuristic racers, F-Zero GX is at the very top of this genre's peak. It's fast, smooth, and longer than games such as Extreme G3 or WipeOut 3. It's going to be hard to top this one for quite some time. Blow the walls off this mutha, and get F-Zero GX. F-Zero GX is very challenging, but also well worth the money and time. It's fast, smooth and packed with more depth than you would expect.